Carol Travis Alonso es una física estadounidense, codescubridora de un elemento químico producido artifialmente: el seaborgio (1974).​ Ha trabajado en diversos laboratorios de investigación en física nuclear de la Universidad de California, Berkeley. Está casada con el también físico Jose R. Alonso. Element 106. A. Ghiorso, J. M. Nitschke, J. R. Alonso, C. T. Alonso, M. Nurmia, G. T. Seaborg, E. K. Hulet, y R. W. Lougheed. Physical Review Letters, volumen 33, núm. 25, 1974, pág. 1490–1493. RELATIVISTIC 3-D NUCLEAR HYDROBYNAMICS WITH MONTE CARLO PIONS. JONATHAN A. ZINGMAN, THOMAS L. MCABEE, JAMES R. WILSON, CAROL T. ALONSO. Mayo de 1987. Report to Congress on Stockpile Reliability, Role of Nuclear Testing, Miller, George H., Paul S. Brown, y Carol T. Alonso, Lawrence Livermore National Laboratory. Report No. UCRL-53822, Octubre 1987. Collective Flow And Pion Production In A Hydrodynamic Model. J.A. Zingman, T.L. Mcabee, J.R. Wilson, C.T. Alonso (LLNL, Livermore) . 1988. Phys. Rev. C 38:760-764, 1988. Hydrodynamic Simulations Of O-16 + Pb-208 Collisions At 200-Gev/N. T.L. Mcabee, J.R. Wilson, J.A. Zingman, C.T. Alonso (LLNL, Livermore) . 1989. Mod. Phys. Lett. A 4:983-993, 1989. Hydrodynamic modeling of heavy ion collisions. J.R. Wilson, C.T. Alonso, T.L. McAbee, R. Vogt (LLNL, Livermore) . 1990. En: Jackson Hole 1990, Proceedings, Nuclear dynamics VI* 47-50. Simulations of dynamic pion production in 60-A/GeV and 200-A/GeV collisions of O-16 + Au-197. J.R. Wilson, T.L. McAbee, C.T. Alonso (LLNL, Livermore) . 1990. Int. J. Mod. Phys. A 5:543-558, 1990. ↑ "Element 106." A. Ghiorso, J. M. Nitschke, J. R. Alonso, C. T. Alonso, M. Nurmia, G. T. Seaborg, E. K. Hulet, y R. W. Lougheed. Physical Review Letters, volumen 33, núm. 25, 1974, pág. 1490–1493. ↑ The Elements of a Lifetime. A Scientific Celebration of Al Ghiorso's 90th Birthday. PAUL PREUSS. Berkeley Lab View. 22 de julio de 2005. ↑ An Early History of LBNL. Glenn T. Seaborg on the 65th Anniversary of Lawrence Berkeley National Laboratory - 26 de agosto de 1996. 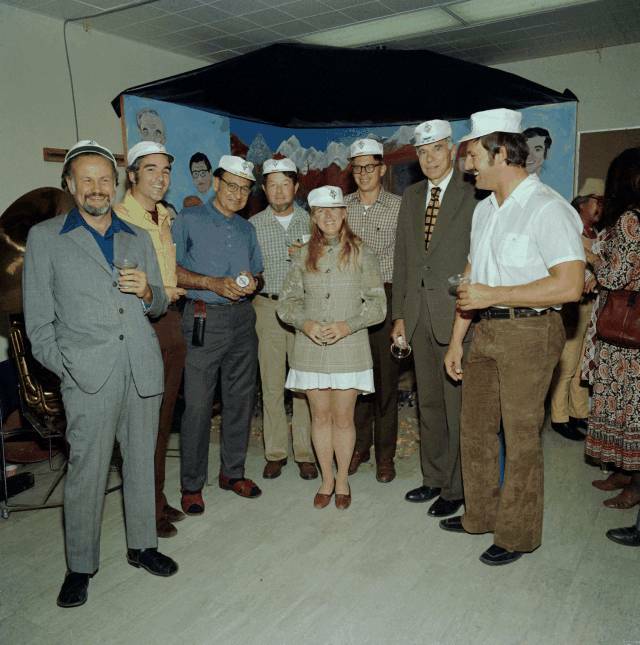 Fotografía de los descubridores del seaborgio (1974): Matti Nurmia, Jose R. Alonso, Albert Ghiorso, E. Kenneth Hulet, Carol T. Alonso, Ronald W. Lougheed, Glenn T. Seaborg, y J. Michael Nitschke. Esta página se editó por última vez el 15 ene 2018 a las 16:49.